Rapidly deliver accurate and cost-effective energy-audits with Energy Audit Software. Energy Audit Software can significantly cut the time it takes to provide a business with personalized energy-efficiency advice supported by accurate figures. Make sophisticated energy-related calculations in seconds - calculate figures relating to a business's energy consumption, energy costs, and carbon dioxide emissions (CO2). Rapidly create a focused energy-efficiency report telling the business how much they could save, and how to go about saving it. BizEE Benchmark - For exceptionally fast energy-auditing, BizEE Benchmark requires only basic knowledge of energy-efficiency. Provided past energy consumption data is available, a relatively comprehensive report can be generated in minutes (see sample report). BizEE Pro - Designed for energy-efficiency professionals, BizEE Pro allows for greater detail and flexibility. BizEE Pro helps the professional to calculate the savings-potential of the specific energy-efficiency measures that they think appropriate. BizEE Benchmark or BizEE Pro? BizEE Pro has been designed for professionals with a good knowledge of energy-efficiency: it helps such professionals to audit businesses faster, more accurately, and more cost-effectively. However, BizEE Pro is not a substitute for expert knowledge. BizEE Benchmark has a much wider potential audience. Its automated approach allows the energy-efficiency of a business to be audited extremely quickly, without requiring much knowledge of energy-efficiency. 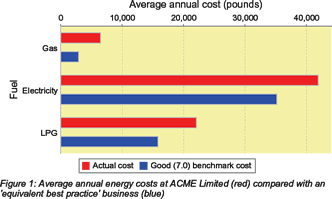 It can be used by energy-efficiency professionals for broad-brush auditing, but it can also be used effectively by organizations offering energy-efficiency advice alongside other services (e.g. accountants, business consultants, energy suppliers). See the pages on BizEE Benchmark and BizEE Pro for more information. BizEE Benchmark can be used for an initial 'broad-brush' energy-audit, to provide the business with an informative report, and to determine whether it would be worth carrying out a more detailed audit. If there is significant potential for cost savings, the file created with BizEE Benchmark can be used as a starting point for a more detailed BizEE Pro audit. There is no need to re-enter energy consumption data*, and no need for an energy-efficiency professional to waste valuable time on a business with little potential for energy savings. * Energy consumption data are not required to carry out an audit using BizEE Pro, but, when available, can be used to improve the accuracy of the calculations. Neither of our Energy Audit Software packages are available yet. If you'd like us to let you know when they do become available, please email info@energyauditsoftware.com.